Today was just like any other Saturday and most of our Saturdays are like this. A bit unplanned, a bit of innovation but finally quite pleasurable. We are "late risers" and on weekends our day begins well after the sun passes the zenith (except when we are going on a vacation, and this exception does happen often). But today was a "lève-tard" (translates to "rise-late") weekend. We had our usual brunch of fruits, yogurt and bread for me and sausages with smelly french cheese for Mitra (yes he prefers to break rules when it comes to eating habits). Then it was time for some activity. Going for a Hemingway type aimless walk around Paris was out of the question for today. Early autumn in Paris is often gloomy with the sun rarely peeping out from behind the clouds. But today the weather decided to remind us of the Indian monsoons by unleashing upon us a torrential tropical-like rain. Though heavy downpours never last long in this part of the world, but it was enough to prevent us from venturing out for a stroll in the by-lanes of Paris and restrict us to our neighborhood in the southern suburb of 'la ville de l'amour'. Now it was time to do something so that my Saturday would not be wasted. The only option left, to make it pleasurable was to do that which I like best- Cooking, but what? Something that I have never tried before, something new, may be even something no one has probably ever tried before !!! Soon without prevision we found ourselves in the local supermarket, Carrefour, looking for random ingredients for some new dish. First to choose the meat. Chicken is too common-place, Mitra loves duck, but me, I prefer them alive and quacking, beef would take too long to cook and it was already around 6 P.M. when we decided to give cooking a go for tonight. So we chose pork. Now for a little detail about the types of pork meat available here in France. Basically here in France almost every part of the pig is eaten. 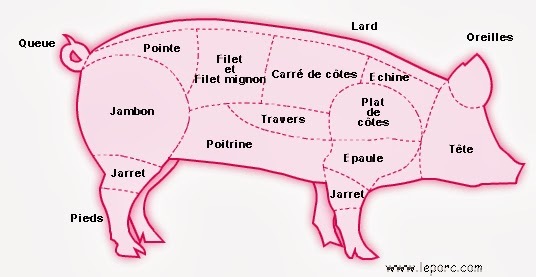 As a common french saying goes "dans le cochon, tout est bon" or "In a pig, everything is good". The jambon or ham is a specialty. But since we arrived late, the butcher had few options that he could offer. 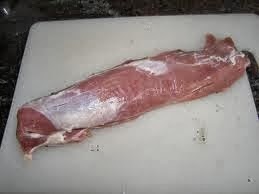 "Carré de cotes" or rib chops was available that is used for pork chops or côtelette. But such dishes need atleast 4-5 hours of marination and we were in no mood for a past-midnight dinner. So we decided on the boneless "filet mignon" (french for cute filet) which is the most tender part of the pork and thus needs the least cooking time. In other parts of the world, filet mignon can also refer to a similar cut of beef, but here in France it denotes exclusively to the most tender (and the most expensive) cut of pork. We took around 500 grams which cost us roughly around €6.50. Now that the meat is chosen it was time to decide on the dish and to buy the ingredients. Generally apple is an excellent combination for any pork dish and so we quickly picked up 3 red "Gala" apples. Mitra is going to Dijon, the capital of the Burgundy region, next week for a conference and that reminded me of a dish which is quite famous in that region, the Beef bourguignon. Inspired from it, I decided to create my own recipe, the improvised form of the Bourguignon but with pork. I bought the ingredients which we did not have at home. Here is the list of ingredients that I needed. The wine: As it can be seen this dish, like Beef bourguignon needs red wine. Our favorite red wine happens to be the ones from the Bordeaux region of France. But the strong character of Bordeaux wines, with their predominant woody flavour would be a hindrance to the dish I had in mind! So we started looking for some sweeter and light flavoured wine. The automatic choice for such a wine would be the fruity flavoured Burgundy from the same region as that of Beef bourguignon. But we were looking to innovate and Mitra was in a mood to try out and discover new wine growers. We had not tasted too much of the wines from the Languedoc-Roussillon region which happens to be the oldest wine producing area of France and wine has been produced here since the Hellenistic times of around 5th century BC. We chose a cultivator known for their pink wine to guarantee us a mild flavored red wine. Tursan is a AOC red wine from the Landes department of south western France made from cabernet grapes. The mark of AOC or "Appellation d'origine Contrôlée" is very important to verify the authenticity and somewhat guarantee the quality of french wines and it is a must for us when choosing wines to drink or to cook. Having gathered all that we needed for this dish we came back home and started preparing to cook. It was about 8 P.M. and it was one of those days when Mitra suddenly developed a passion for cooking. Apart from photography, his other passions generally vacillate and today was the day he decided to cook. Well it was good for me, acting as the head chef, now I had my assistant ready to help me on with the cooking (rather only limited to chopping, cutting and frying). Amazingly the dish was ready in around 1.30-1.45 hours and we started to enjoy our dinner at 10.00 P.M. Not that late given our standards. Here is the procedure we used to prepare this dish.